This amulet is the image of a bubbling cauldron, which is a powerful symbol of magical rebirth and the forces of creation. It is adorned with a five pointed star, a single symbol representing the five elements, and comes with a separate small pentagram, a symbol representing the five elements encircled or protected by a symbol that represents eternity or infinity. Both of these amulets are attached to a single black cord together where one point of the pentagram meets the handle of the cauldron. 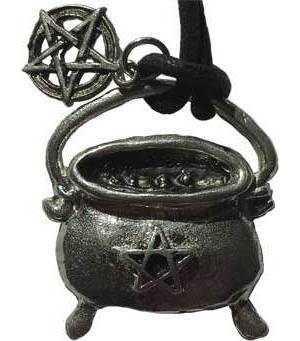 This black cast iron cauldron amulet measures 1" by 1" and comes with a cord, is crafted of pewter and was made in the USA.